Maybe you're in the area for a rock climbing holiday, but want a day with some added adventure. A ridge traverse could be just what you're looking for. Below are a few of our favourites. 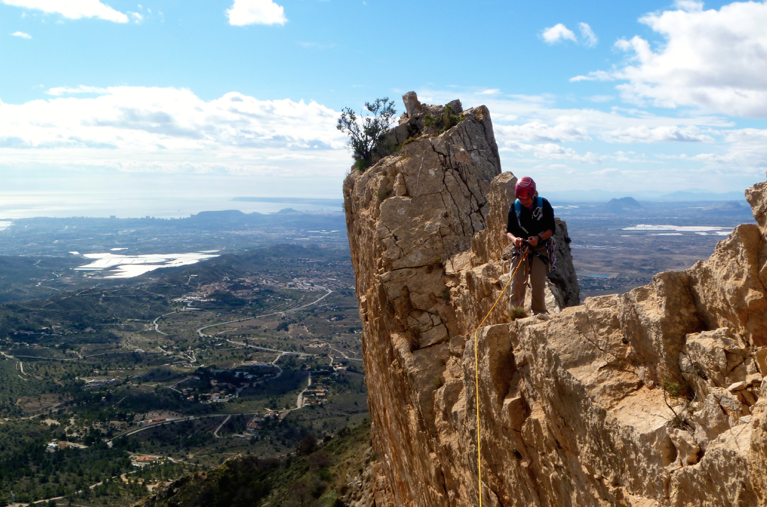 This is the classic ridge traverse on the Costa Blanca and well worth a day of anyones time. It's a mountaineering day out and a serious undertaking. The ridge stays around the 1000m contour for much of its length and can be exposed to bad weather, high winds, but also very intense sun, go prepared. We have traversed this quite a few times now over the years, it's always a pleasure and a tremendous amount of fun. Approach: From the N-332 follow signs for Xalo (Jalon) and immediately turn left onto the CV-749 Pinos road following this to the end at a T junction, turn left and park shortly after the Bernia restaurant. From her follow a good track heading for the seaward end of the ridge, passing a font (delicious water here) and follow the steps through the rock outcrops. Keep on this path all as it climbs uphill to reach the 'Forat' (large hole / tunnel through the rock). Gear up here and continue by scrambling upwards towards the ridge on its seaward side. Numerous routes exist to reach this point. Ridge: Once on the ridge the route is mostly quite obvious and occasionally marked with red dots. There is a tricky and exposed down climb (may be cord in place for abseil 2016), only short but undercut. This soon leads to the first proper roped section, this can be abseiled to a ledge or rope up and 'walk the ridge' for the full effect (bolts protect both options). There's a bolted belay on the far side. From now on the ridge is narrow and extremely exposed, but not technically difficult. 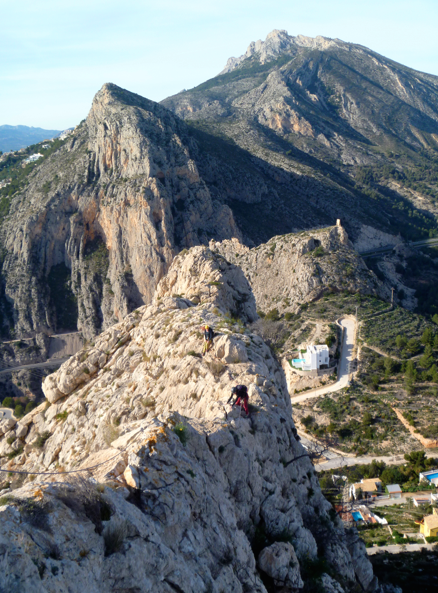 A bolted abseil station is reached, the abseil is no more than 20m and leads to a wide ledge, from here easy scrambling regains the undulating ridge. There are 3 fins ahead, the right most fin has a 4+ climbing section and is fantastic. ​The climb is well bolted and can be aided if required (have at least 10 quickdraws). The bolted belay above is on a good ledge that is very exposed. More exposed scrambling leads to a minor summit. Soon another abseil station is reached, this can be easily avoided by scrambling to the right (looking down). A number of false summits keep coming before descending to a col complete with log book - sign this - then choose to descend here via the amazing scree run, or continue to the main summit via further easy scrambling and walking. Our route descends the scree run, loads of fun and rapid. Descent: From the log book col descend Northwards to the amazing scree run keeping to the right of the huge boulder in the distance, this will avoid the dense vegetation below. Once the path is reached turn left for an easy walk back to the car and hopefully a coffee & cake (or beer) in the restaurant. Time (car to car): Approximately 6 hours - but allow more if the main summit is included. Equipment: 40m rope, helmet, harness, 10 quickdraws, belay device, prussik, rock shoes, plenty of water - it gets hot up there and there's no water! There's a number of ways to tackle this one, here's our take on it, we think it's brilliant. Approach: From the N-332 take the Maryville turning near Calpe. From here it's best to use the Rockfax guidebook description as for Toix Este. Take the first left then right at a T-junction to reach the end of the road. Park here or as near as is practical. Continue on foot as the lane turns right going uphill to reach the crag in a couple of minutes. Walk under the first section of crag following a good track heading towards a headland, there is a sign here pointing to various climbs. Take a path to the crag and reach a wide bay, on the right of this is a wide arete. This is 'Epsolon Arta' grade 4 and is marked by yellow threads (2016) trending rightwards up the arete. The climbing is straightforward and above the first pitch a variety of routes can be followed, all about between 3+ & 4+ and marked with threads and bolts. Towards the top the rock gives way to vegetation and easy scrambling to reach a wide bay (bolt). 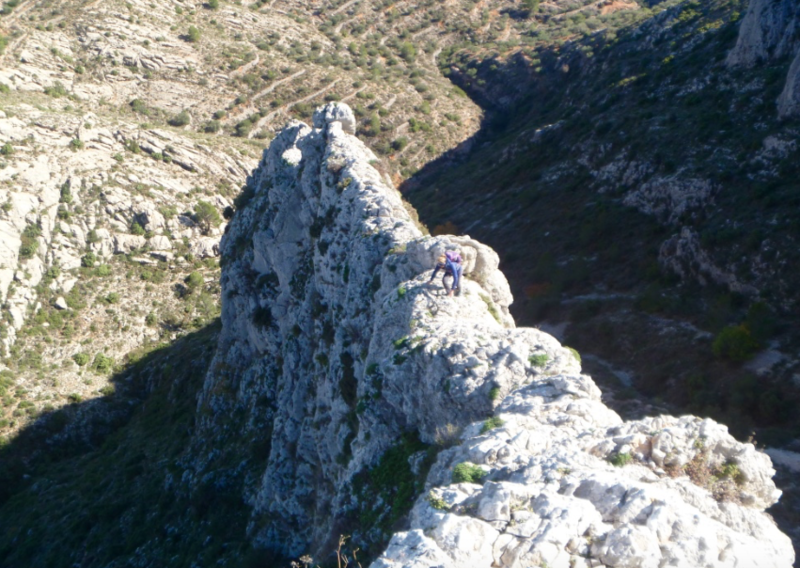 Ridge: From the bolt head left until the ridge above can be reached, gain this and follow it to reach the mirador, this is lots of fun and mostly grade 2 scrambling in a beautiful location. Go left at the mirador, passing Toix TV and descending to Toix Placa. There are many routes here that can be taken to reach the ridge far above. A fine choice would be Lara 4+ - name marked on rock and bolts mark the way. This route is about 80m and done in 3 pitches, the upper 2 are excellent. From the top belay continue upwards over easy terrain to reach the ridge near a notch and the narrows. ​Belay here before tackling the arete. This can be done in 2 pitches with a good belay on the left at about 40m. From here continue more steeply, initially keeping right of the pinnacles but later stepping onto them for full exposure. A block belay lies just short of the summit. Easy scrambling leads to the TV masts. Descent: From the TV masts follow the surfaced track towards the sea and to the mirador, from here follow lanes downhill back to Toix Este. Launching swiftly out of the ground near the sea, this huge ridge is quite a sight and a distraction for climbers driving on the nearby A-7 motorway. It's around 4km long and has numerous technical sections. Here we describe the Western section that is quite achievable by a fit party in a day. It takes in some amazing scenery and allows lots of straightforward scrambling to be enjoyed with only minimal use of the rope. Approach: From the N-332 turn right just north of Ondara, then left at the next 2 roundabouts and back under the motorway. Shortly after turn right onto a single track lane through orange groves and continue along this small lane to reach the Segaria recreation area, park here. Aim for the large col in the ridge. Follow paths as they zig-zag towards this, sometimes vague but stick with it. On either side of the col are extensive climbing crags for those seeking further adventure. Ridge: From the col turn left (west) to follow the broad ridge through sometimes dense vegetation. The summit is reached in about 25 minutes. There's a log book here so take the time to sign in. The ridge continues in an undulating fashion before reaching a huge notch. An abseil station lies about 30m back by a flat slab. The threads are in a poor state (Jan 2016) so either replace these before abseiling or down climb with care from here to reach level ground leading into the notch. The climb out is on the left side and a lot of fun, it's about 2+ and straightforward the whole way. 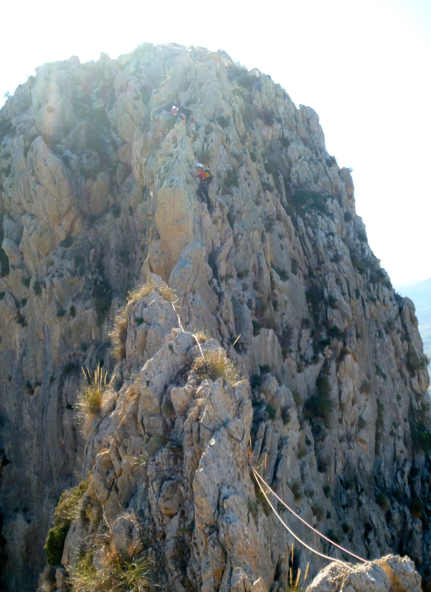 Once at the top a narrow arete is gained and followed, this is spectacular and a real highlight of the day. Eventually this widens and descends to the final abseil station. To locate this scramble down squeezing passed a pinnacle to reach a tree, the bolt belay is next to the tree. 25m abseil reaches easy ground and the end of the scrambling. Descent: From the TV masts follow tracks left (South side of ridge) to descend either to the road or to follow a disused water channel back to the recreation area. Time (car to car): Allow about 5 hours for this section. This is like the Bernia ridge on Red Bull! Narrow and exposed, little travelled and with a wild feel, this is for the ridge connoisseur and will be savoured by all who travel over these hallowed rocks. It is a long day out though, and 2 cars are needed to make this practical. Approach: Leave a car at the end of the ridge. To get here take the CV-758 from Finestrat towards Sella for 2km, at post boxes turn right and follow this for 2.8km to a junction, continue straight on for 1km to a small lay by, park here. 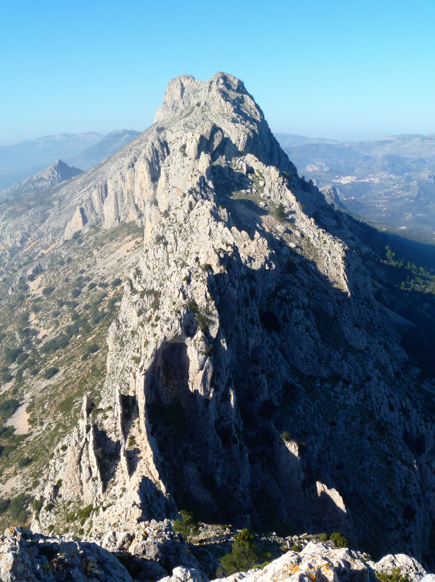 For the start of the ridge, follow the CV-758 from Finestrat towards Sella for 4.5km, just before the 13km sign turn right and park here. Follow the minor road towards a quarry, just before the barrier turn right onto a dirt track, follow this passing the quarry on the left (below). At a bend turn right again and shortly after reach a col and bend. From here follow a vague path through scrub towards the ridge, about 35 minutes. Ridge: There's not much chance of getting lost on this one, it's too narrow for that. Start at the base and follow the steepening ridge at about 2+ to reach the first summit. From here the ridge narrows markedly and is castellated. Some will prefer to pitch these sections, others may move together. There are some bolted belays but slings are also useful to protect the traverses. A 2nd summit is soon encountered. From here descend to reach a bolted abseil (30m) which leads to easier ground. A further castellated section is traversed to reach another bolted abseil station (approx 20m), this leads to more easy ground and the end of the difficulties. Walk up to the summit of Realet 3 (the 3rd summit) then lookout for a vague track leading down the north side, zig-zagging through steep ground, generally trending left (facing out). There is an abseil point near a Pine tree (approx 25m), this leads to open ledges and a vague path heading left (looking out) to locate the final abseil (10m) near a notch. Descent: From the final abseil, easy scrambling leads to vague paths through the terraces, keep heading for the low ridge on the right, once gained follow this to the road and car number 2. Time (car to car): approximately 8 hours. Equipment: 60m single or 2 x 40m ropes, helmet, harness, belay device, prussik, slings to protect climbing sections. The first notable mountain when leaving Alicante airport is Cabezon de Oro (head of gold), but from this side it doesn't show itself off to the full. 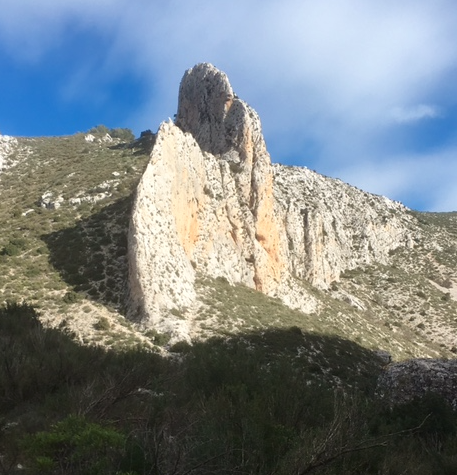 However, take a drive beyond Busot and towards the Caves of Canelobre and wow, this amount of rock, huge cliffs, and amazing ridges all appear. With easy access and an ice cream shop at the bottom, this place has plenty to recommend it. Approach: From the A-7 motorway take junction 681 towards Busot, following the CV-773 soon pick up signs for the Cuevas de Canelobre, follow these all the way to the parking area by the cave entrance. Note: it's also possible to park in a large lay-by about 500m before reaching the caves. From the parking area follow a good path zig-zagging downhill towards the end seaward end of the ridge. This path skirts over a split in the ridge near its base, continue to the right hand rib and start at a diagonal fault line. Ridge: Follow easy rocks at first, with opportunity for escape to the right for quite some time. Stick to the crest as much as possible, roping up whenever it feels necessary. There's a really good mix of easy (grade 1) scrambling and climbing up to grade 3+ (about v'diff) over some extremely exposed terrain. Care is required at all times as there is much loose rock. Belays are fairly easy to find and a good selection of slings will prove useful for setting these up and for protecting the climbing sections. A notably long, narrow section gives much excitement and good, exposed moves throughout, this then leads on to the final scramble to the top. From here the ridge widens and descends to a col and the end of the scrambling. Descent: It's possible to descend left from the col, with steep ground (and a vague path) leading back to the road and parking area. Or, the more leisurely descent is to firstly tick the summit straight ahead, then descend to the next col, from here head over to the pine woods and bear right through these (on small tracks) to soon reach an excellent 'PR' trail. Turn right onto this and follow it back to the parking area. Near the crags of Salem and Bellus, rising from the fertile interior is this winding rocky crest leading the intrepid adventurer to the summit of Benicadell. Easy access and approach along with continuously interesting climbing / scrambling make this a very worthwhile day out. Approach: Follow the CV-60 heading inland towards Xativa, turn onto the CV-615 at Castello de Rugat and follow this through Rafol de Salem and on towards Beniatjar. Shortly before arriving at Beniatjar and at a sharp bend in the road, turn left onto a dirt track marked with the sign 'Ombria del Benicadell'. Follow this uphill, turning right at the only junction. Casa Forestal is at the end of this track, park here. Continue along the track (through a vehicular barrier) until a left turning, go left and follow this to reach an obvious path on the right. Follow this as it descends parallel to the ridge, immediately before the base is reached look out for a cave type recess, the route starts here. Ridge: The first pitch (4+) traverses through the cave (pegs) to reach a good belay (bolts). The second pitch (4) goes directly up from here (pegs) to gain the ridge proper. From now on follow the crest of the ridge as much as possible, passing the occasional bolt. For some, much of the ridge may feel okay to solo, but if in doubt keep the rope on, for the exposure is substantial. There are a few possible escape routes down to the left (looking up) should time be running against you. At the chimney crack (bolt) go straight up this and slightly right at the top to maintain the ridge line. Descent: The ridge terminates at a trig point on the summit of Benicadell at 1104 metres. From here follow a good footpath (PR route) as it zigzags down the north side of the mountain towards Casa Forestal. Equipment: 50m single rope, helmet, harness, belay device, prussik, 5 quickdraws, and a selection of slings. There are no abseils on this one, so a shorter rope would be fine too. 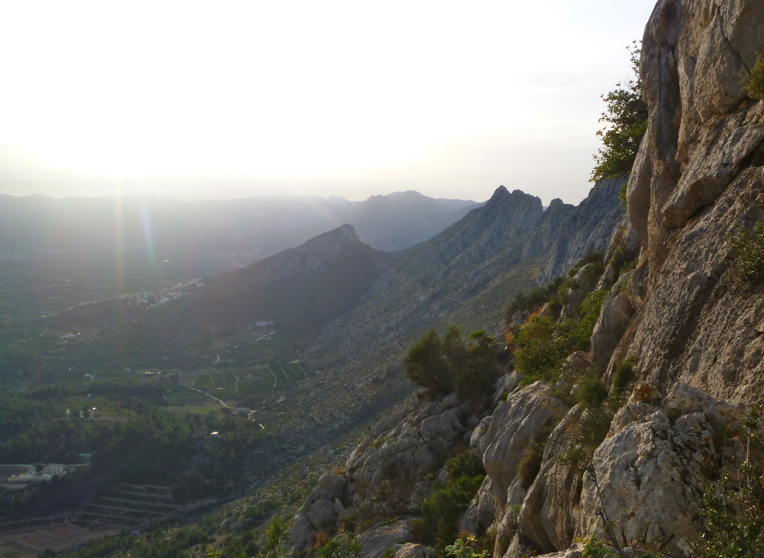 Deep in the Jalon valley, near to the mountain village of Castell de Castells, lies an area with a real feeling of wilderness. ; Yes it's not far from villages, but you wouldn't know it. Don't expect any mobile phone signal either, thankfully there are still a few corners of Europe where the mobile doesn't work, and this is one of them. Approach: Follow the CV-720 through the Jalon valley towards Castell de Castells, a couple of km's before reaching the village turn right at the Pla de Petracos sign. Follow this narrow, surfaced lane, passing the Petracos caves (well worth stopping for a look at the ancient paintings) and continuing for another few km's to a parking place at the head of the Malafi gorge. Followed a vague trail through the almond grove just above the Malafi and separating it from another canyon to the right. The ridge can be seen clearly from here, it is straightforward to reach the base in under 20 minutes. There are 3 pitches with scrambling and walking to connect the lower and upper sections. The initial pitch is vegetated (new routes often are) but fun and challenging. Belays will take a bit of finding too. The 2nd pitch gives the crux, following a fine and exposed arete. This offers exciting climbing and wild exposure, but do beware of loose rock! A further pitch lies further above, after a short walk through an orchid filled landscape (springtime). Many lines can be followed, we choose a route into a niche and this gave solid rock and fine climbing, albeit quite easy. Topping out onto Limestone pavement with a wild landscape all around is a pretty inspiring experience and makes this ridge well worth seeking out. Descent: Upon reaching level terrain bear slightly left to follow the high ground above the Malafi gorge. This soon leads to a subsidiary canyon that can be descended with care to reach the Malafi gorge. There are places in the canyon where some may prefer to abseil rather than down-scramble, we found this straightforward to set up when needed. Equipment: 40m single rope, helmet, harness, belay device, prussik, large cams and a selection of slings. Note: the photo below is of another ridge in the Malafi area, but not the one described above (no decent photos of it yet). We have also traversed the ridge in the photo, but do not recommend it at present due to it being severely loose! We hope to change that in the coming months / years and will provide a write up when this happens. Driving along the Vall de Gallinera this is the obvious ridge on the south side of the valley. Aesthetically pleasing, easy access, and a dramatic finish make for a brilliant day out. From the bakery in Benissivi, follow the newly installed signs for La Forada until within about 150m of the base of the ridge, turn off the main track here and follow a smaller path leading around the left side of a large tower and so to the base of the ridge and a good gearing up ledge. There is a small amount of fixed gear which aids route finding. Belays mostly have a single bolt and thread (autumn 2017). The fixed gear on the pitches consists of: threads; pegs; bolts. These are very sparse so take a light trad rack. This ridge has so far seen very few ascents. This means there's still a lot of loose rock up there (the crag is massive), so wear a helmet and be gentle with the rock! From part way along the final pitch, it's possible to abseil (approx 20m) into the Forat for a fun and dramatic finale to the day. Or if preferred, continue along until the ridge meets the bulk of the mountain. From the summit, follow the main PR route heading towards the coast, soon turn left to follow a good path down the north side of the mountain to regain your approach route. As a party of 3 and allowing for rests, lunch, photos, etc we spent 5 hours 30 minutes from leaving Benissivi to arriving back in the village. A fast team will easily do this in around 4 hours. Benissivi may only be a small village, but it has bars, cafes, restaurants, and a bakery! 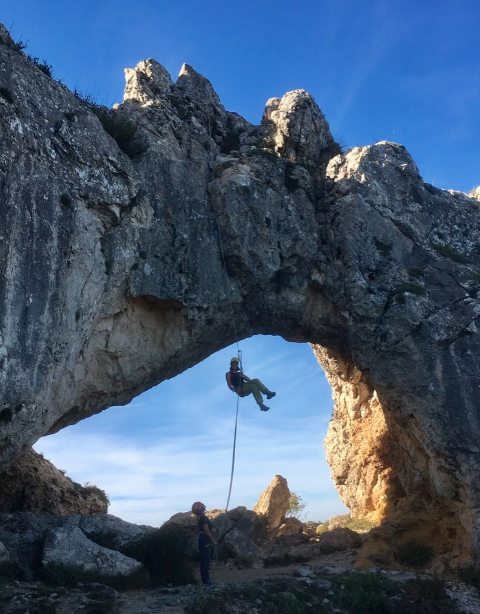 For anyone looking to experience rock climbing, mountain walking, canyoning, ridge scrambles, or via ferrata, and would like some sunshine & warmth mixed in, why not get in touch and let us put together an itinerary to suit you.